Hello! How are you? This was such a rollercoaster week. Thank God for God and therapy and chocolate. Am I right? I’m the not-so-proud owner of a bunch of new pimples. So I have that going for me. I did really go to therapy this week to talk through some stuff. I am a fan of therapy. If you’ve never given it a whirl, I’d suggest considering it. We all have stuff that would be nice to talk out with a neutral person. Unfortunately, therapists aren’t supposed to tell you exactly what to do. I guess that’s what mom’s are for? Anyway. I just want someone to tell me what to do with everything – life, liberty, the pursuit of happiness. Or maybe I’m supposed to listen to God and I’m drowning it out with wine and trash TV? Or maybe this post has taken an odd turn and I don’t even know where I’m going with any of this?? 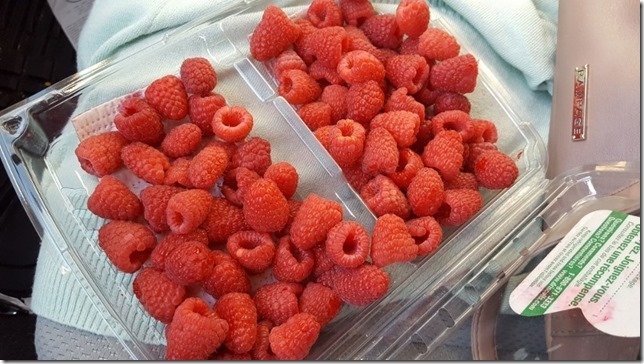 I had a lil snackaroo of raspberries and all the Costco samples this afternoon. Then, I took a walk. 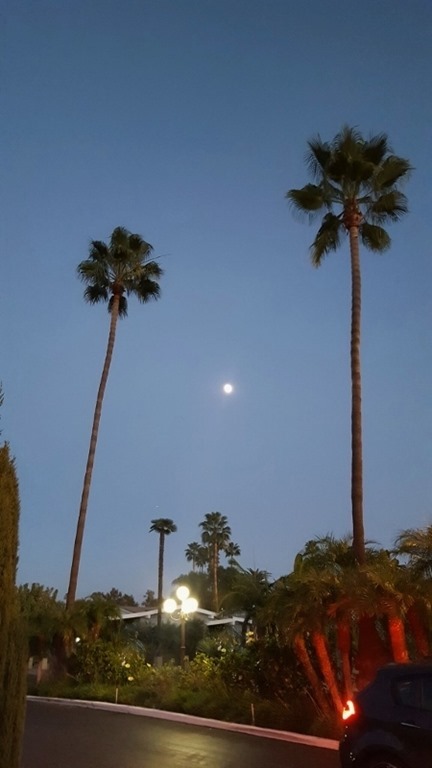 It was only around 4:45pm and looked like midnight. But I prefer early morning sunrises because that’s when I run, so I’ll take it. 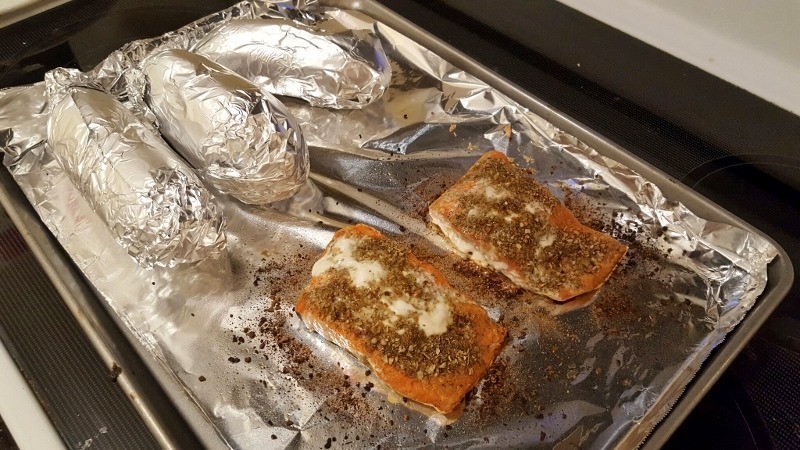 I made a fancy (to me) dinner of salmon, sweet potato and salad. I always make extra when I cook so I have easy, healthy leftovers for lunch or dinner the next day. Boom. Lazy and smart at the same time. 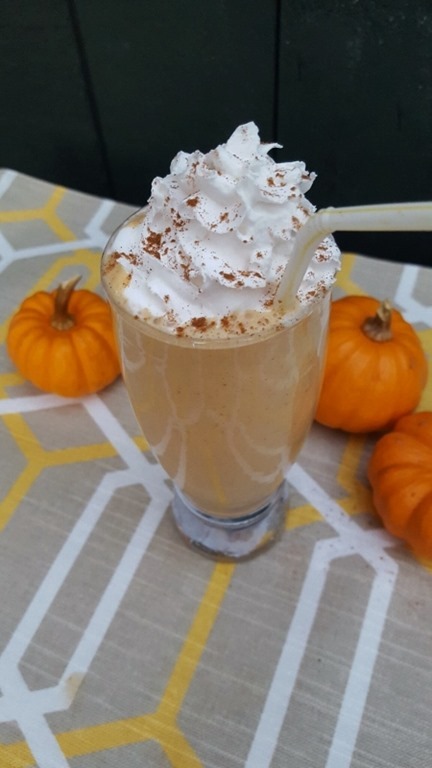 This afternoon I was craving a fun pumpkin treat. I decided to make a pumpkin protein shake since it’s still so warm here. It was the perfect filling, sweet snack. add whipped cream to everything. 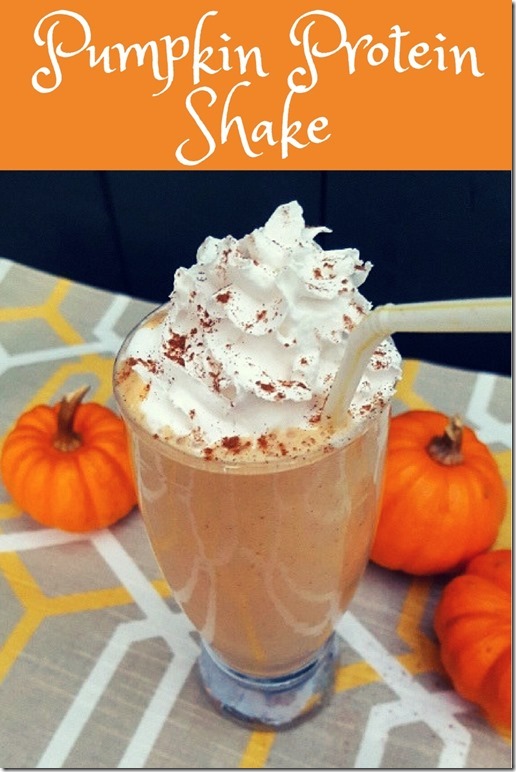 This Pumpkin Pie Smoothie was super easy – just protein powder, ice, pumpkin, pp spice, stevia, almond milk. Then, add whipped cream per my life advice. 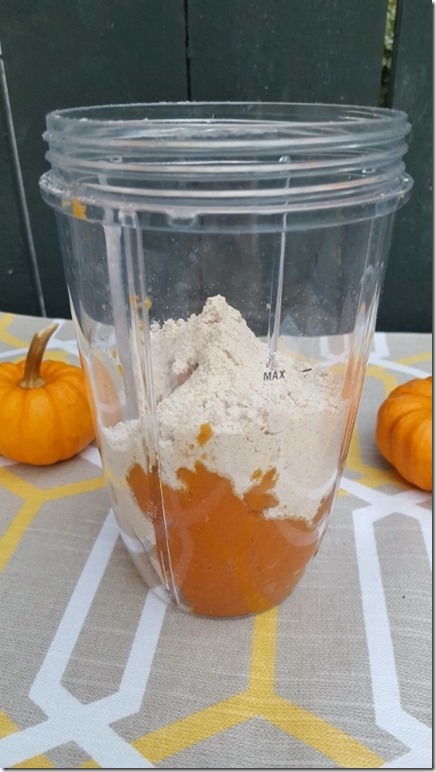 Vanilla Protein powder – I used an Advo vanilla powder packet it’s probably the equivalent of a heaping scoop from a canister. Then, blend and add sweetener or ice to your preference. I topped it with whipped cream and more pumpkin pie spice. LAST DAY of week 2!! How are you doing? Sticking to it? Need a push? Well, imagine Vegas is pushing you with his little furry paw to get up and go! November is Runner Safety Month. I have done a whole series on runner safety before – it’s important! 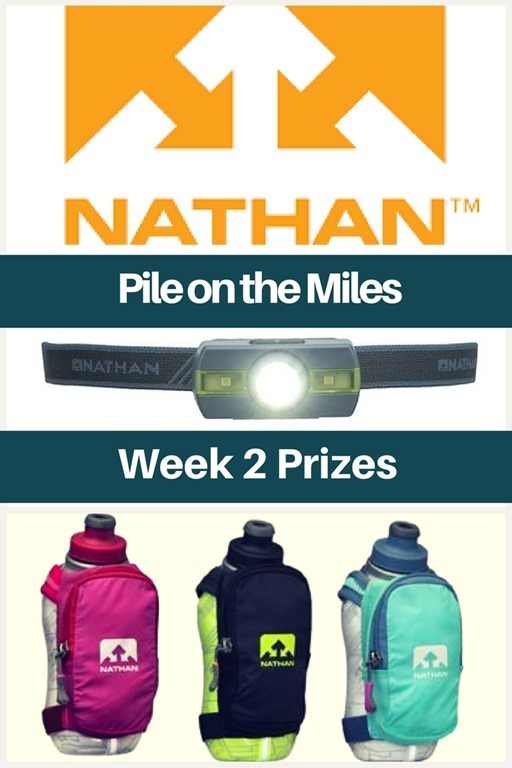 This week Nathan is sponsoring the challenge and giving away two pieces of must have running gear. I’ll pick a different winner for every day this week tomorrow. They are giving away a Speedraw Plus Waterbottle and a Neutron Fire Runner’s Headlamp to 6 different POTMers! Check in below with your POTM update to be entered to WIN. Follow them on twitter at @nathansportsinc for more information on Runner Safety Month and their line of running products. Leave a comment on this post and you’ll be entered to WIN a Nathan Headlamp and Handheld Waterbottle! Closes tomorrow at 9pm PST. Question: What is your POTM check in? Me: I have a race coming! Disclaimer: Nathan is providing the prizes for this week’s POTM challenge. All opinions are my own. All I did today was some stretching. I was gone almost all day with work and then a family event. I think I’ll be breaking in the ‘ol treadmill to POTM today. I just could NOT make myself get out of the warmth of my bed this morning. I love the cooler weather for daytime running, but it makes morning and evening runs very dark and cold. 🙁 I have appointments all afternoon (small daylight window after work of 4-6) so I think it’s time…Hello, indoor running, I have not missed you! I ran 9 miles on Saturday, felt good at the time but now my hip hurts. Back to the elliptical for me! I ran 6.2 mils on the treadmill today (11/12). I enjoyed watching Grey Anatomy, but it wasn’t as good as its been lately. 5 more miles on Saturday before my fitbit died 🙁 I’m guessing somewhere around 7 total for the day? Ran a 10k this morning! Dangit I forgot to post yesterday, but I got in 6! Ran a whopping 22 miles today! 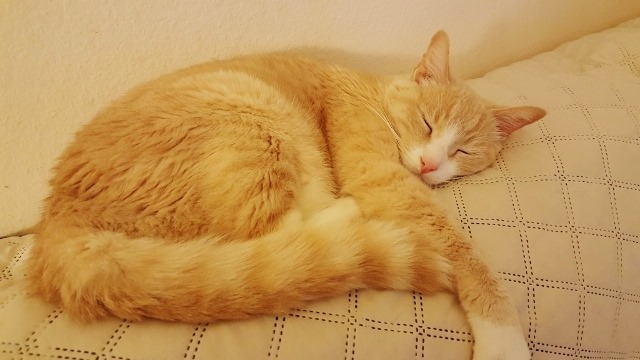 Cat life is so tough! Vegas is such a cutie. That pumpkin smoothie looks amazing!! Almost like pumpkin pie in a cup I bet! Ran a veterans day 5k and then shopping with my munchkin! Had a nice, relaxing rest day today. 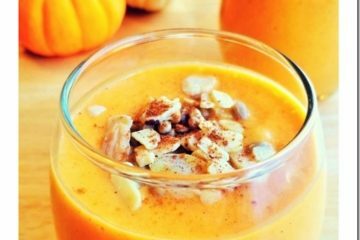 Oh yum pumpkin 🙂 I’ll need to try that. Day 12 activity was 45 minutes on the arc trainer at Planet Fitness and lower body weight machines. 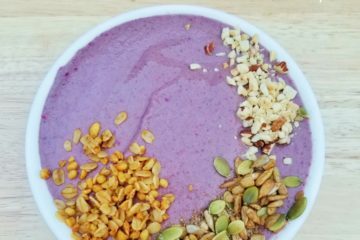 Great protein shake idea, love it! Walk with the dog 30 minutes! Today I ran a little over 9 miles with a friend and her dog. It was brilliantly sunny out. Um that shake sounds amazing. I LOVE pumpkin!!!! 13.5 miles today and I kept it pretty easy in terms of pace. Took a rest day today. Long run and yoga tomorrow, can’t wait! I did an awesome class at the gym this morning & I have a 5k in Annapolis with the elementary boys that I coach tomorrow morning. Go HERO Boys! Rest day today. But still did 2 nice walks to get my 10,000 steps in. I got 23,000 steps in today. I love running! Rest day! Went on a long walk downtown to stretch my legs. Off day! 6 in the AM! another day – another mile. Getting so cold ! Boo! No break today because we were short staffed so no lunch run. I can’t wait to get out tomorrow for a long ride. I ran a hilly, windy, and rainy 5 miles today! 25 minutes of yoga and a long walk! 4 miles today plus 2 short walks. 4 miles this afternoon. First run since the marathon. I got in 3.51 this morning! I ran a half marathon this morning (13.1 miles). Hoping for a short recovery run tomorrow morning. An easy 3 miles this morning as a shake-out run before the HALF MARATHON tomorrow! Ran the last leg of a marathon relay today. It’s kind of hard to start that late in the day since I don’t like eating before I run. 4 mile walk last night. 8k turkey trot this morning. I went to an intense circuit class at the gym. Planning to run a bunch tomorrow! I ran 5.5 miles this morning! First run since the marathon. Rest day and I plan for a walk later! Today was a hike, elliptical, and a bit of weights! Rest day today. Barely moved. Boom. 30 minute walk, and 30 on the elliptical. Killing it today:)! 10k today. No PR, there were no less than half a dozen hills, but, did place in my age group. I did three easy miles this morning! Race day tomorrow! 5 miles on the treadmill 🙂 so happy to have this challenge to keep me motivated and help me meetand exceed my goal! Woo hoo! 6.5 miles. Only wanted 5 but got lost. 3 miles. I was walking to my car in the empty parking lot. Suddenly I saw a shadow running up behind me and in the same instant felt something brush against the back of my leg. I screamed and jumped. Thankfully, it was a harmless black Lab with a dumb owner. My heart beat faster in that split second than the whole run. Long run today; 14 miles! Today is a rest day… I’ll be dealing with lots of house and yard work instead! Rest day! 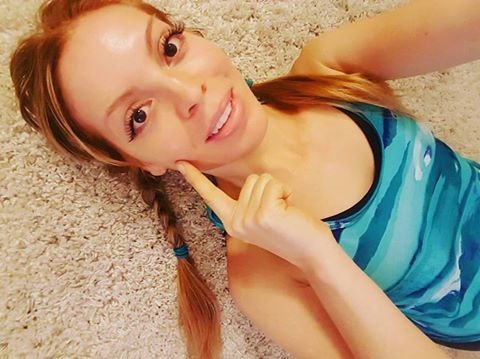 I exercised every day this week so far, so I’m happy! 10 mile trail race this morning! turkey trot this morning with my running friends! That smoothie looks delicious!! No workout planned, but I’m walking around Chicago all day seeing the sights…counts as a workout right? Still going strong. 95 minutes today on the elliptical. I did a very tough boxing class today and could barely shampoo my hair after. Good stuff! 3 miles in the rain today! I ran 9.2 km in the pouring rain – felt like a kid sploshing through the puddles! Spin class for me this morning! I got in 4 miles. It feels great to start increasing mileage after an injury. Today is all about retail therapy with 2 Lularoe parties! Running will resume tomorrow! 11.5mi run this AM while listening to a new book! AND post-run pumpkin pie oatmeal bowl 🙂 got to use that pumpkin while its in-season!! I ground out 15.7 miles today for a total of 67.4 for the week. I have 56 miles to go to reach my POTM goal. I also managed to get a PR on a 5K today Woot! I was able to get in a run this morning before I had to come to work. Just a couple miles but more than I thought was going to happen and it was before most people were up and about which made it even better! Hour long walk to clear my head! Today is my rest day, so I did 40 min of Yoga with Adriene. Felt so good! Last night I went to the gym, then ran 6.8 miles. Today is technically a rest day, but I’m walking around DTLA taste testing french dip sandwiches instead. 3 miles before my kids woke up, then 2 more miles later. All the miles done! Woohoo!! Thank you for setting up Piles on the Miles. It’s hard at times but so motivating especially right at the time when it gets dark so early. Only 3 miles today because tomorrow is marathon day!! Sticking to things! I made myself go to the gym last night, even though sitting on the couch and eating chocolate sounded much more appealing. Today I’m off for a 12 mile hike! Going to hit the trail for 7 miles! Race tomorrow so probably a couple easy treadmill miles to shake out the legs. Yes on whipped cream! Love to just eat it straight from the can! I planned to run 3 miles later today but it’s such a nice day I might run a few extra. 2 miles so I can heal my hip and knee. just saw the most gorgeous sunrise – such an uplifting start to my day! 5k run and a lovely cooldown walk. Today’s my rest day since I did my long run yesterday! Going to go for a long walk after work! I’ll be on the elliptical for hopefully 3 miles later! Vegas looks like how I feel…oh to be a cat. It got cold overnight but I”m still going to get my walking miles in once the sun comes up and I can walk on the sunny side of the street. Then I’ll go into Vegas-mode for the rest of the day!